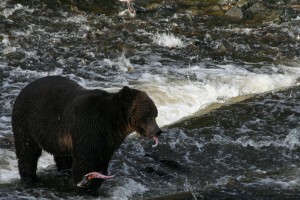 Grizzly bears can be selective in the parts of the salmon they choose to eat. 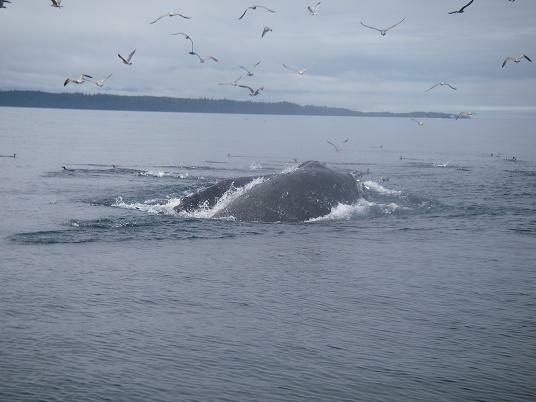 It all depends on what time it is in the salmon run and who close to hibernation. When the salmon first arrive the bears have been maintaining their weight eating sedge grass and berries so early on grizzlies will eat the entire fish except for the intestines. As time progresses and the bears are less ravenous these less hungry bears consume only the eggs, brains and skin of the salmon, which are the fattiest parts. Near the end of the salmon run if the bear has not attained enough fat content it will return to eating the whole salmon. Also true at certain times of the season is it is common to watch grizzly bears reject the male salmon they catch for the egg rich females. In this picture one can see part of the egg sack exposed after the fat rich belly has been removed.